Luca speaking, I am XDGuru’s founder. Besides working as a freelance UI/UX designer, I really enjoy teaching other people the skills I acquired over my years of design experience. This is one of the reasons why I created XDGuru in the first place, which actually started as a Youtube Channel with video tutorials for Adobe XD, and then developed into a full website for Adobe XD resources. So a few months ago I decided to pour all my XD knowledge into a video course. The result is a 2 hours long Adobe XD course packed with useful tips, design techniques and best practices. I wanted to create something very practical, with a learn-by-doing approach and real world scenarios, so in this course I am teaching how to design and prototype a great looking mobile app made of 7 different screens. 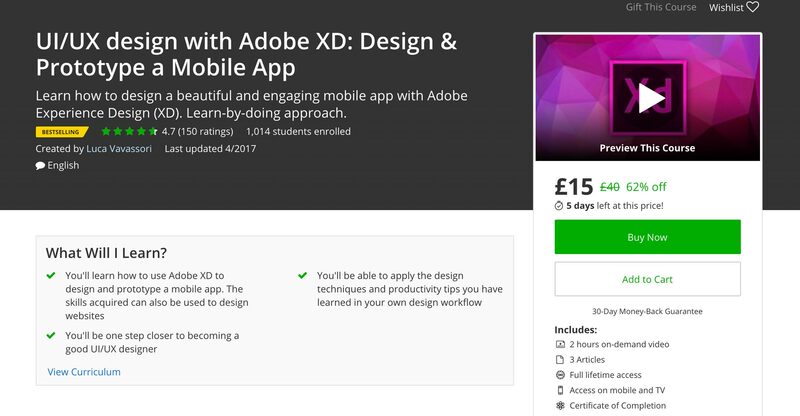 Yes, you will be able to learn Adobe XD while designing a real app from scratch! As you can see from the screenshot above, this XD course is hosted on Udemy.com, and I am actually surprised by the kind of positive feedback I got from it so far! In just a few months, more than 1000 students took the course and it received 150 reviews with an overall 4.7 rating. Knowing that my students appreciate what I am teaching is an amazing feeling, and I’d love XDGuru’s readers to have a go at this course too. PS: The app we’ll be designing in the course is based on the “Hooked” Free UI kit that some of you might have already downloaded. I really enjoyed your course, I learned so much in just 2 hours! Fantastic course! learnt so much! Thank you so much! Great info. Got me ahead in my web design class.